Daily cleanser combines delicate oils, moisture hugging oatmeal, and organic fair-trade coffee leaving skin soft and radiant. May be used on face, neck, and body. For all skin types. Use Rejuvenating Toner for best clean skin results. *Kayello Coffee is a philanthropic artisan coffee roasting company located in Northeast Ohio. With your every purchase of Kayello Organic Coffee Scrub, this quarter, Dermadeli will donate $1 on your behalf to Kayello Coffee’s organization of choice. The right combination of nourishing and hydrating ingredients come together to provide conditioned skin. Plant based ingredients join together to bring your skin to its natural tone. The Kayello Organic Coffee Scrub will even skin tone and discoloration most prominent on elbows, knees, underarms, and elsewhere you find uneven tones. This cleanser is a mixture of nourishing and cleansing delicate oils, glycolics and moisture hugging oatmeal. 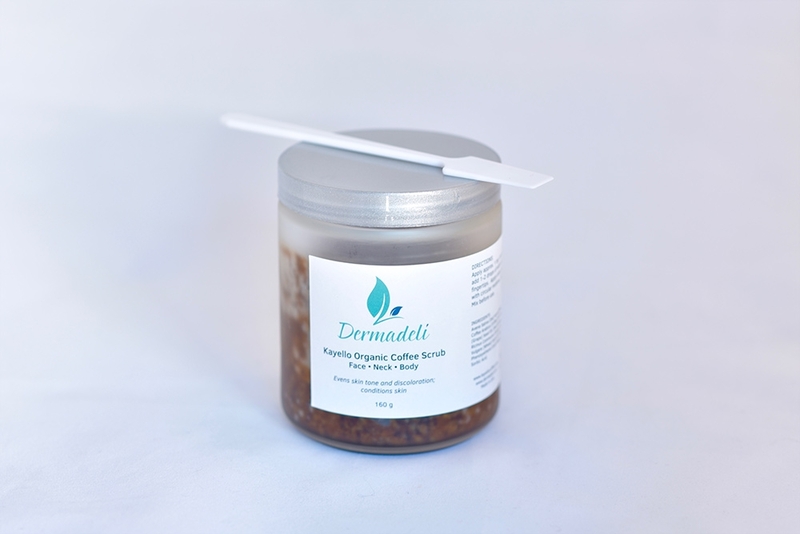 Oatmeal is the ultimate hydrating element, when combined with the glycolic action of the sugar, this unique product cleans and conditions skin. With the added Kojic Dipalmitate, a plant based ingredient, your skin will have even tones and no discoloration. 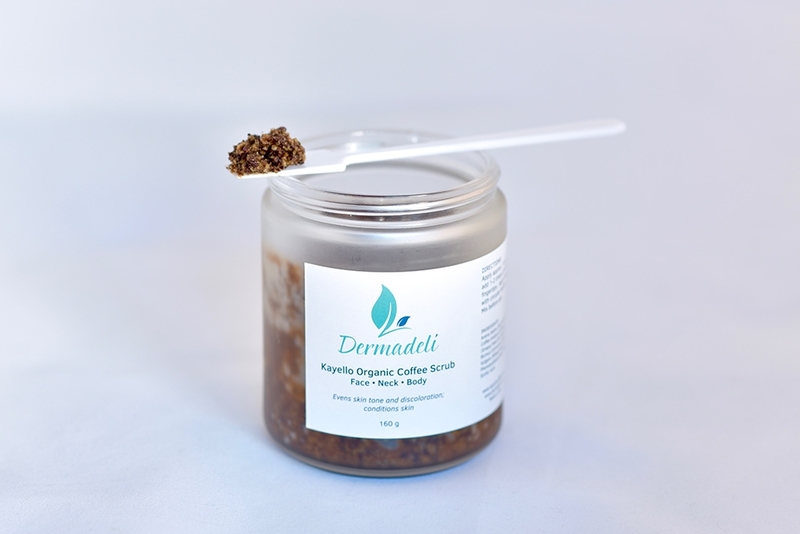 Skin will be its natural tone, and left feeling clean and soft without the tight, dry feeling of most cleansers. Directions: Apply approx. 1 tsp onto palm of hand, add 1-2 drops of water and mix with fingertips. Apply onto dampened skin with circular motions. May be used daily. Mix before use. Avena Sativa (Oat) Kernel Meal, Sucrose, Organic Coffee Arabica (Coffee) Seed Powder, Vitis Vinifera (Grape) Seed Oil, Olea Europaea (Olive) Fruit Oil, Ricinus Communis (Castor) Seed Oil, Triticum Vulgare (Wheat) Germ Oil, Kojic Dipalmitate, Phenoxyethanol (and) Caprylyl Glycol (and) Sorbic Acid. *Please visit Kayello Coffee for more information on their mission and Organic Fair-Trade Coffee. Amazing product. It leaves skin feeling soft and smooth and looking brighter and more radiant. The smell is phenomenal…coffee lovers rejoice! Love this product and highly recommend it. I have been using this product for about 2 months now and I could not have been more pleased! Not only does it leave my skin feeling silky and smooth but it also helps to reduce dark spots on areas such as my elbows and knees. I love it because it’s an amazing cleanser plus helps bring a beautiful glow to the skin! Thanks Dermadeli! Loved this product! I used it for about a month and I’ve tried everything for my dark pregnancy mask I had on my neck. I would absolutely buy it again!